We can use various styles to handle conflict. We can do it quickly with little regard for the relationships that we harm. We can make consensus the goal and take the time needed to ensure that each and every person’s voice is heard and that their needs are met. We usually have a preferred style of conflict resolution, but we need to be able to use the style that is most likely to get us the outcome that we want. Below is model that displays various ways to deal with conflict. It’s the Thomas-Kilmann Instrument (TKI) Model. You can take an assessment to figure out your preferred conflict style. Our individual preferences are nice to know, but it’s more important to understand that each of these approaches to conflict is appropriate in different situations. First, let’s look at the model. Assertiveness is the vertical axis on the left side of the graph. The higher up a conflict style is on the graph, the more assertive it is. The axis at the bottom indicates how cooperative a person is being when using a particular approach to conflict. 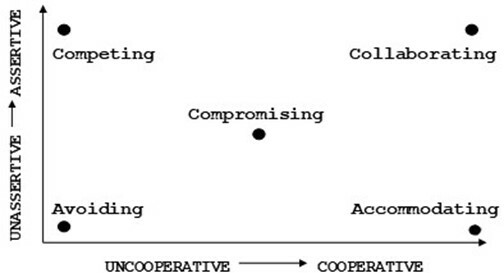 The conflict approaches farther to the right use more cooperation than the ones on the left. In workshops, I use the example of a mom and her children deciding where to go to dinner to illustrate the different approaches to conflict. COMPETING. If you look at the graphic, you can see that when we use a Competing approach to conflict, we are being very assertive and very uncooperative. In the Competing style, we adopt an “I win and you lose” perspective. We are going to use everything we’ve got to get our own way. Relationships don’t matter to us. In our dining example, the mom really wants Mexican food, and she tells the kids to get in the car because they are going to a Mexican restaurant. There is no discussion, and the children have no input. We can only use the Competing style if we have the power to make everyone do what we want. For example, the five year old of the family would not be able to force the family to go for pizza because she can’t drive or pay. There are times when the Competing approach is appropriate. The first situation is when safety is an immediate issue. I am going to yell at you to stop if you are about to walk into the street where a bus will inevitably hit you. If I am facilitating a class and the fire alarm goes off, I’m not going to ask the group how they want to leave the room and which exit they want to use. I’m going to tell them exactly what to do. The military uses a Competing style in critical situations. No military leader in his or her right mind is going to take a vote on how to react to an ambush or how to move forward in an attack. In the everyday world, we use lack of time as our reason for using a Competing approach. Most of us feel very busy, and we don’t think that we have time to ask for input and have a discussion about a situation or decision. It’s important to note that the input and discussion are worth the time and should be included whenever possible. People feel part of a decision when they have input. They also feel valued. The Competing style does not enhance the positivity of relationships and should only be used when absolutely necessary. ACCOMMODATING. In an Accommodating style of conflict resolution, the outcome doesn’t matter to us. In our dinner example, the mom doesn’t really care where the family goes to dinner. Pizza may not be her favorite, but if that is what everyone else wants, she is willing to drive them there and eat some pizza. 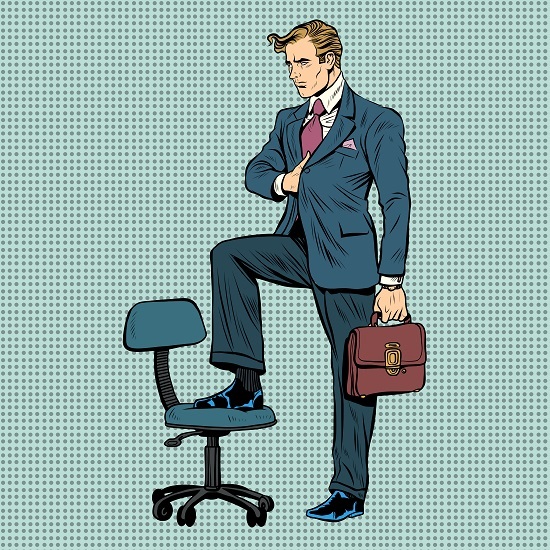 As leaders, we want to use the Accommodating style whenever possible. We want to give others as much autonomy as we can. It’s motivating to have some power over how we do things or what we are achieving. Some leaders have trouble letting people do things their own way. Make an effort to let others lead and decide whenever you can. It’s fine to leave the decisions to others when we truly don’t care about the outcome. It is not okay to say we don’t care when we really do – that’s passive-aggressive behavior. If I say that I don’t care where we go to dinner, I need to truly not care where we go to dinner. AVOIDING. When we use an Avoiding conflict resolution style, we don’t take part in the conflict at all. We would be the teenager of the family who doesn’t want to be seen out in public with our lame family under any circumstance, so dinner is irrelevant. We aren’t assertive, but we also aren’t cooperative. We don’t care about what anyone else wants, and we don’t want to deal with them or the situation. It is appropriate to use the Avoiding style when the situation has nothing to do with us. We often get worked up about decisions and how something “should” be done when we are not truly affected. For example, it may offend our moral sensibilities when someone is not working the way we believe that he or she should. However, performance issues are usually between a person and his or her supervisor. It’s best if we do our work to the best of our abilities and let them work it out. Our participation is not needed or helpful. COMPROMISING. The Compromising approach is the one that is used most often and is appropriate much of the time. When using it, we ensure that everyone’s ideas are heard and then meet as many needs of as many people as possible in a reasonable amount of time. Remember, our personal needs are to be listened to, understood, and respected. We can do all of those things when using a Compromising style and develop and maintain positive relationships. When deciding where to go to dinner, we might take suggestions and then ask for a vote. Telling one child that she can choose where we go for dessert next time because she doesn’t want to go eat ice cream like everyone else is a Compromising style. COLLABORATING. The Collaborating style is both very cooperative and very assertive. The goal is to satisfy the needs of everyone. This style requires a lot of time, energy, and commitment. 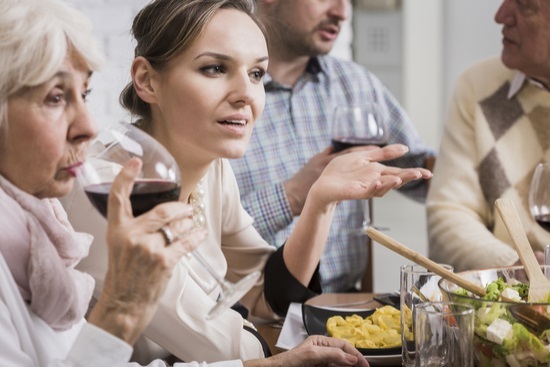 In our dinner example, we are going to make sure that everyone is happy with our restaurant choice and everyone is committed to making the best darn decision that we can. We are going to make a list of possible restaurants, ask for input from everyone, and consider how far each is from the house. We might create a list of average costs for a meal for each place that we are considering. We would also consider when each person ate last at the places being considered. We are going to spend a spend a good chunk of time on this and should probably be considering where to eat next week and not tonight. The Collaborating style is appropriate for big, expensive decisions. If we are deciding where to build a new facility or whether or not to buy a house, we want to be sure that we have researched all the pertinent facts and unearthed as many advantages and disadvantages as possible. Using a Collaborative style helps to ensure that we aren’t missing any vital information needed to make a good decision. We each have our own preferred style of conflict resolution. That style can change when we are stressed. It’s good to be aware of our preferences, but it’s also important not to be a one-hit wonder and only use that style. Great leaders use the style appropriate for the situation – no matter what their preferences are. Sometimes I help groups that are stuck in disagreement find solutions. When we meet, every person who walks in the door has the problem in one pocket and the solution in the other pocket. They are all completely certain that their view of the situation are clear and correct. They also believe that they have determined the correct solution using the best criteria. What’s fascinating is that each person has his or her own definition of the problem that is rarely the same as anyone else’s. The solutions they bring are different, and the standards used to judge those solutions’ correctness often vary wildly. Of course, they don’t know all that when they walk in. They’ve been arguing but not listening. They may know each other’s solutions, but they rarely have figured out why each person believes that their solution is best. They have been arguing positions without asking questions or truly listening. The best illustration of what is missing from the discussion is the Conversation Outline that I’ve talked about before (https://kathystoddardtorrey.wordpress.com/2017/08/15/lets-talk-conversation-outline). When in conflict, we usually jump from Opening to Develop Solutions. It amounts to saying, “Let’s talk about the new procedure” and then each person insisting that his or her way is the right way. This chain of events damages relationships and doesn’t increase the chances of the group agreeing to anything other than the fact that they don’t like each other. 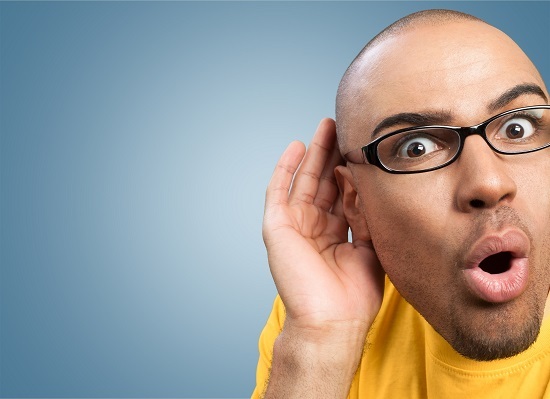 The Listen and Share stage is often skipped, and it is where the biggest picture of the problem is discovered. Let’s say that a team must decide on a vendor to use for a new project. One person believes that the most reliable vendor is the one to choose. Another thinks that the lowest-cost vendor is the best choice. Another person might say that they should stick with the one that they have now with whom they’ve built a relationship. One team member thinks they should give a brand new and promising vendor an opportunity. Each person is using reasonable criteria for his or her decision. In the Listen and Share stage, the group stops to figure out what those criteria are – they listen for understanding. In the process, they acquire a complete view of the situation. In essence, they pull the problems and solutions out of their pockets and lay them all out on the table. Then they examine them one by one without trying to convince each other of anything. The discussion is truly sharing and listening – not arguing or convincing. Here is an important side note: authentic curiosity is imperative! You can ask the questions above with a sarcastic or snide tone and ruin the relationship and the discussion. It can be difficult to put our egos aside and listen to other people’s ideas, but listening and curiosity are the keys to great solutions. If you are having a hard time, remember that maintaining a positive relationship with others is key in getting to your desired outcome. No one likes to “give in” to someone who is mean to them. After I have guided a group through the discussion process, they come up with a better solution than any one person brought through the door. It’s a better solution because it’s been created by many different brains and perspectives. We take the collective knowledge of the group and then use their collective brain power to decide on the best course of action for the group or organization. It is a fabulous process to watch. There may be a person or two who won’t let go of a solution because it helps them the most or just because they’ve let their egos get the best of them. Those people who put their own needs above the needs of others and the organization benefit from coaching conversations with their leaders. Once a person has taken a strong position, it can be difficult to change because it feels like defeat. It’s important for the group to accept a person’s change in position gracefully and never do the “I told you so” dance or say, “I knew you’d come around to the right way of thinking.” Not cool. For the most part, after a facilitated discussion, there is more understanding and less animosity – and the decision is a good one that the group feels confident about. 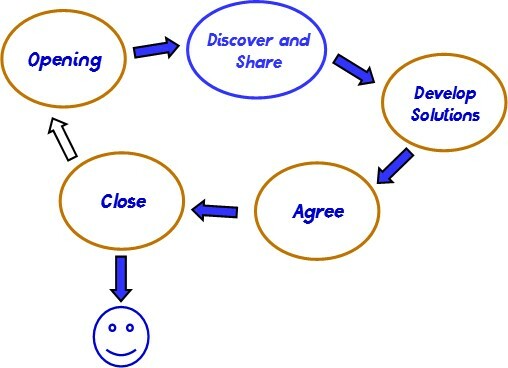 You can achieve those same results by focusing on the Listen and Share stage of the conversation outline. Ensuring that every person’s perspective is heard and understood makes finding a solution much, much easier. Keeping the outcome that you want to happen in the forefront of your mind during a conflict is a powerful tool. I learned the value of this technique back when I was a Cub Scout leader, well before I had any training in communication and conflict resolution. The event was a tiny blip on the grand scheme of life, but the lesson that I learned has served me well for about two decades. The leaders of the Cub Scout pack that we belonged to included a few petty, mean-spirited people. For the most part, I led my Webelos Den and had as little to do with them as possible. However, we were about to have a meeting to discuss our year-end banquet, where the boys in my den would graduate from Cub Scouts and move on to Boy Scouts. I don’t remember all the details, but when I got to the meeting I discovered that the other leaders had met in secret before the official meeting and made some infuriating decisions that were going to affect my Webelos. I was furious. I was angry at the manipulation and deception, and outraged at the other leaders’ behavior, which was decidedly un-Scout like. I am a woman with a temper, and my first impulse was to storm out of the room. As I sat there fuming, a couple of things occurred to me. First, they were counting on me leaving so that they could have free rein to do whatever they pleased. They could legitimately say that I had left and they had carried on as best they could if I left the meeting in a huff. They were a particularly sneaky lot. Second, I realized that if I left, my den would have had no representation. My obligation and responsibility was to the boys I had worked with for the last two years. I knew them well and was very fond of them. I decided that I needed to swallow my anger and pride and continue to represent them and work for their best interests. It became a mantra in my mind during the discussion – “you represent the boys.” I vividly remember one woman who was really taking delight in trying to bait me. I stayed calm, looked her in the eye, and argued logically and reasonably. I never lost my temper despite the fact that I was roiling inside. The outcome I wanted was for my Webelos to have the recognition and banquet that they deserved as they left Cub Scouts for Boy Scouts. I kept that outcome in mind and held onto it tightly. In the end, I was satisfied with the plans for the banquet. Because I stayed calm and reasonable, I gained back a lot of the ground lost in the others’ secret meeting. I felt cheated of a good temper-tantrum yelling match but proud of myself for staying calm and representing those boys who were not able to represent themselves. I remember walking out into the cool night air after the meeting and being startled by what I had accomplished. I was in awe of the power of self-discipline – controlling my temper. For me, it was an enormous revelation to see that I could get the outcome that I wanted if I could keep the coolest head. Amazing. Life changing. Later I learned about Emotional Intelligence. In its simplest form, there are four categories of Emotional Intelligence: self-awareness, self-discipline, relationship awareness, and relationship management. There is real power in using self-discipline to achieve your desired outcome in a conflict. Self-discipline means controlling our impulses; we pause to think before we act. Our first impulse might be to yell at someone who has done a poor job or insulted us. However, yelling doesn’t create a positive work environment, foster positive relationships, or get us closer to what we want to achieve in a disagreement. Think of self-discipline as a muscle. The more you exercise it, the stronger it gets! Each time that you exercise self-control, you make it easier the next time. Make a practice of pausing and taking a breath whenever you feel an undesirable impulse coming on. Think of the consequences, and make a decision that is in alignment with your values and goals. I must admit that there is immediate gratification in yelling and belittling others when someone makes us angry during an argument. However, there are consequences to our actions. We damage the relationship and our own reliability and trustworthiness. People won’t trust or respect us, and we hurt our chances of getting desired outcomes in the future. It’s easier to control our impulses if we hold tightly to the outcome that we want. When tempted to yell or make personal jabs, remember that those actions will lessen your chances of getting the outcome that you want. 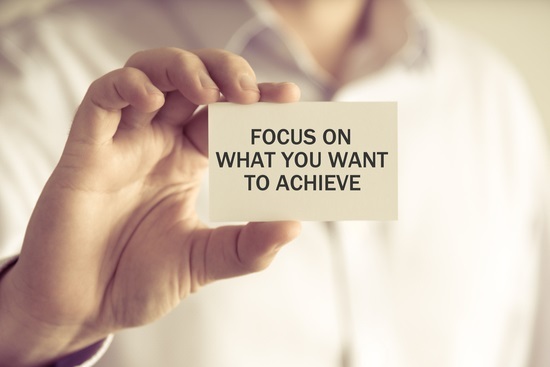 Hold tightly to your desired outcome, and use self-discipline to act in ways that will help you achieve it.